The Longhorns began spring football practice on Monday. AUSTIN, Texas — The defending Sugar Bowl Champions began preparations for their encore performance Monday morning. “A lot of good looking athletes running around out there,” said Texas Head Coach Tom Herman. Herman is all smiles about the latest infusion of young talent. 10 early enrollee freshmen, including two game changer athletes in Bru McCoy from California and Jordan Whittington from Cuero, Texas. “We had to get more athletic offensively,” Herman said. Tom Herman getting interviewed by about the Longhorns' first spring practice. Why do you ask? Well, you may find this hard to believe, Texas was one of two teams in the country last year to not have a play over 50 yards. The Sam Ehlinger led offense only turned the ball over 11 times in 14 games. What’s not shocking is the culture change and attitude towards spring camp and practices in general, especially after last season’s 10-win campaign and the win over Georgia in the Sugar Bowl. “We tell our guys all the time there’s two demands in this program, non-negotiables and ball security,” Herman said. 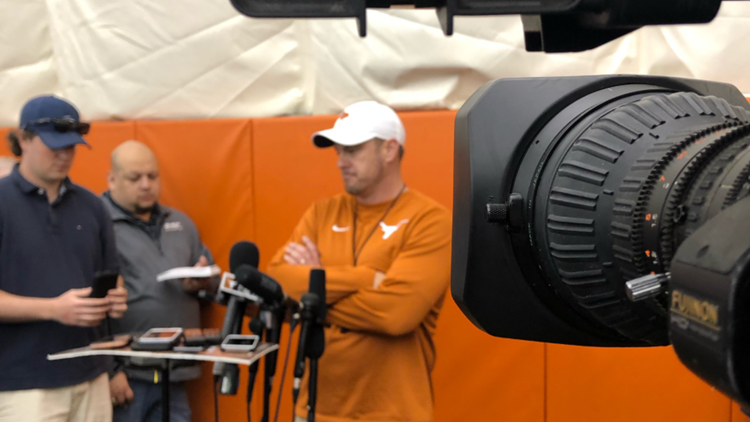 Herman added that his player led leadership police their own teammates and hold each other accountable if one isn’t practicing up to standard. “It’s pretty cool to see,” Herman said. As far as goals for this spring camp. “Develop leadership on defense," Herman said. The Longhorns have to replace 8 starters on defense. “We have to get the ball to all of the talent we have on offense,” Herman said. Offensive lineman, Patrick Hudson has retired from football due to several injuries. Hudson will continue to be involved with the program in another capacity. Defensive lineman Keondre Coburn is dealing with kidney issues and is expected to return. Former Longhorn defensive back great and NFL alum, Nathan Vasher, is a volunteer coach for the Longhorns.